Welcome to The Duchess Beauty Haven, a heavenly Bath based skincare boutique shop and destination beauty salon. We pride ourselves on offering expert skincare and a fabulous experience with our wonderful team of experienced therapists. We are wonderfully located just 5 minutes walk from Bath Abbey - just opposite the Hilton Hotel. You can find us at 33 Walcot Street (just beyond Waitrose). Come and visit us and browse through our carefully selected, ethical, sustainably sourced and mostly locally made skincare products in our newly opened Beauty Haven. We've had such fun choosing and testing the products over many months and we can't wait to share our favourites with you. Bring a friend and discover the eclectic joys that Walcot Street has to offer. We're surrounded by the independent shops that make Bath so special - pick up something for dinner from our neighbours (We're just next door to The Fine Cheese Company). We offer a wide range of treatments and therapies to help ladies and gentlemen look and feel their best, with flexible opening hours and discretion assured. 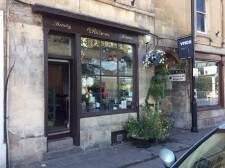 Our Walcot salon is perfect for pampering and feel good treats including our famous manicures and pedicures. Relax and unwind for an hour (or two) and perhaps share this with a friend or loved one? Show off healthy and beautiful hands, feet and nails and enjoy chip-free nail polish for up to 3 weeks? Correct skin problems (blemishes, pigmentation and premature skin ageing) and improve skin tone? Age gracefully - look and feel less tired? Look your best for a special event? then call or drop in to see us and feel free to book a complimentary consultation to discuss any concerns that you may have. We will tailor our treatments to suit your needs and offer the most comprehensive range of beauty and treatment services in Bath and beyond. Our expertise is recognised by our product and equipment providers. We carry the most highly regarded products normally found in the most exclusive spas because we are passionate about what we do and only the best is good enough! For more information, please click here. *GREEN PEEL® FRESH UP A deep cleansing treatment which makes your skin radiant. A Natural Herbal scrub is massaged into the skin to speed the skin metabolism, renewing your complexion from the inside. Perfect as a quick beautifier for regeneration, vitality and anti-aging and suitable for the face, neck and cleavage areas. Helps to deep cleanse skin, improve imperfections, blemshes and mild scarring. This also is an ideal occasional treatment to protect your skin against premature skin aging. *Please note that make-up cannot be applied for 24 hours after a GREEN PEEL® FRESH UP treatment. This treatment is not recommended on the day or the day before a special event nor if you are planning a trip to the Spa afterwards). For best results we recommend that you do not wash your skin for 24 hours to allow the herbs to carry on stimulating the skin. If you're feeling shy about body concerns, come and talk to us. Excess body hair, loose and sagging skin, stretch marks, cellulite, loss of muscle tone, stubborn fat, scaly skin, acne … we've experienced it all! Our experienced therapists take pride in being knowledgeable, impartial and honest. If we can't help or can only offer a management solution, we will say so. Many of our clients come to us at a demanding time in their life when they could benefit from a little TLC, and we like to make a difference - it's a match made in heaven! The Duchess proprietor, Beatrice, trained at the leading beauty school in Europe and designs all our signature treatments. Beatrice brings an empathetic and highly knowledgeable approach to anti-aging and beautifying treatments appreciated by regular clients from Bath, Dubai and beyond. Our manager Emily leads our team of qualified beauty therapists and make-up consultants supported by Sian and Shubnam our helpful and efficient receptionists during school hours. Soheila, our Persian trained beautician joins us from Green Street House. She continues to look after her loyal clientele who have followed her from their favourite Day Spa. Trainee therapist Hannah is a former loyal client who has now joined our happy team to further her knowledge in holistic skincare and beauty treatments. Hannah is really enjoying learning the science behind natural and organic products. Everyone on the team is a trained beauty therapist and make-up consultant, so if you have any questions about skincare products or would like some make-up advice please ask us for assistance. We will be delighted to share our knowledge and passion which has helped us become the only beauty salon in Bath to be Finalists for Bath Life Awards in 2017 and in 2018. To help improve our services, please email us with your feedback. Please click here to email us via our online form.